TRYING TO get your head around the subprime mortgage bubble can be hard. I was under the impression virtually no one came away making any money and it was an all around disaster. The anger comes at the greed and the negligence of the big banks but it's hard to accuse organisation's which acted maliciously. The Big Short concentrates on the few individuals who figured out what was happening and profited from it. Based on Michael Lewis's book, Money Ball, The Blindside, and directed by Adam Mckay, it has surprisingly been hyped for some big awards. Mckay is a veteran of improv comedy. Indeed, he is so highly regarded as a producer on Saturday Night Live, that when he threaten to quit, they gave him a raise and his choice of title. He choose 'Coordinator of Falconry'. He has since stated “I am dangerously unqualified when it comes to falconry”. An interesting choice for this talky, grown-up, topic. It is hard to summarize this story as it is so jargon and lingo heavy, but basically, four separate individuals see the beginning of the end of the housing bubble, and while trying to warn people, they also put themselves in the position to make a lot of money. 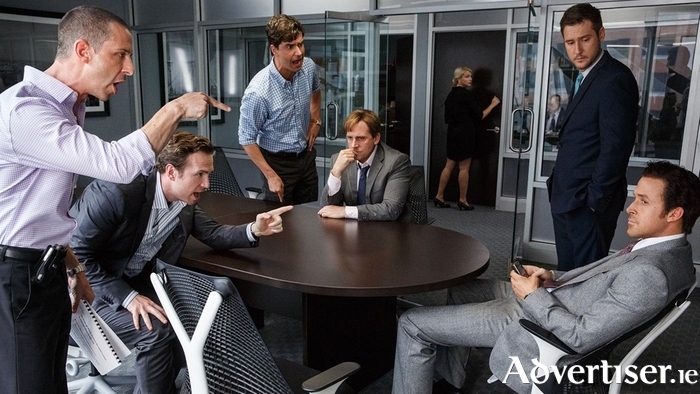 The Big Short has a serious cast with Brad Pitt, Steve Carell, Christian Bale, and Ryan Reynolds. I was very surprised to see Bale get a supporting actor nomination, as he is the weakest of the four big names. He plays Michael Burry, and plays him with some affectations and quirks that tend to get noticed when it comes to awards seasons but it is a little hammy. Steve Carell was the most worthy of awards recognition here, with a manic, desperate, and conflicted, performance. Ryan Reynolds is also pretty, but a little underused. The Big Short is an interesting companion piece to The Wolf of Wall Street, and certainly far more relevant. The Wolf of Wall Street gave some lip service to indicting the behaviour of Jordan Belfort and co, but I never bought it. That movie fetisied money and greed and in the end gave me an uneasy feeling. The Big Short does nothing like this, and it has a conscience. Overall Mckay does good work here but maybe most of the plaudits should go to its editor Hank Corwin. This whole movie feels like it is on a countdown and it certainly adds to the tension. However it sometimes feel like more of a lecture than a story, and I’m so not sure this movie would be nominated for anything if it was released at a different time of year. That is a shame as it might have taken the place of maybe Beasts of No Nation or Straight Outta Compton. It's a fine movie, but there are currently better films out. One for Netflix in a few months time I think!